So last newsletter I asked you all to tell me why you watch the Super Bowl. I didn't get as many responses as I had hoped for but it seemed pretty even between the party, the game and the commercials, and as for me I think all 3 make the Super Bowl the event that it is. I am also working to find the best time to send out my newsletter, I'm looking for the best day of the week to give you info on upcoming shows and events. I had a few people tell me that the mid week letters were good, I also had a couple of you tell me that Monday would be better so that they could plan out their week, and still a few of you thought that Friday would be good because you would be able to read this over the weekend when you had more time. So, here goes, this is the Friday sending, I hope you enjoy it. If you weren't aware, we have the Winternationals going on this weekend in Pomona at the Fairgrounds, and things are really rockin' over there!! It's so cool to be sitting in my office and hearing them making their runs. Gates open at 7:30am Saturday and Championship Sunday, and while you're out there stop by the NHRA Museum and take a tour, it's amazing how much racing history is in one place. Or if you're looking for something a little quieter you can head out towards Palm Springs to the 10th Annual Dr George Car Show in Indian Wells, show starts at 9am and is open to Street Rods, Classics, Muscle Cars, Trucks and Motorcycles. Proceeds from the show benefit The Desert Cancer Foundation. And take your sweetie with you and make a Valentine's weekend getaway out of it. Whatever you do this weekend let's hope this gorgeous Southern California weather stays around, boy you can't beat these sunny days and great temps!! It seems like Spring has come and with it comes all the great car shows, so of course I'll keep you updated and if you have an event coming up be sure to get me the info so I can include it in my weekly newsletters, you can email me at caeperformance@aol.com. 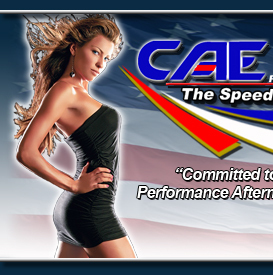 You can also go to our website at www.caeperformance.com and click on the EVENTS tab for a list each month of upcoming shows. If you've missed a recent show just click on the SHOW GALLERIES tab and check out the many slide shows we have while you enjoy the great music that we provde. And if you're on facebook be sure to "LIKE" our fan page, The Speed Shop, so you can keep up on new info and photos of customers cars and show videos. Have a great weekend and get out there and soak up some sun.